In this article, I’d like to review “Divide and Conquer” . 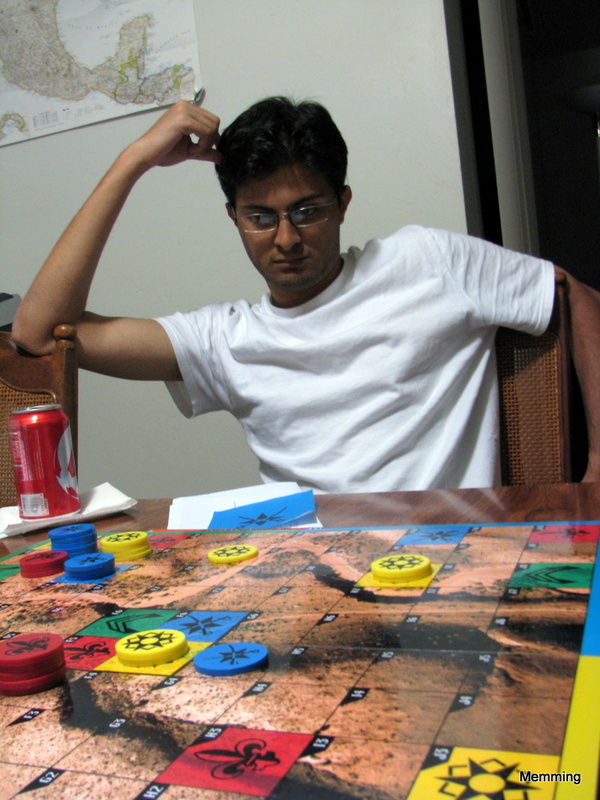 No, not the computer science algorithm designing principle, it’s also a name of a board game. Here’s my long due short review on the game. 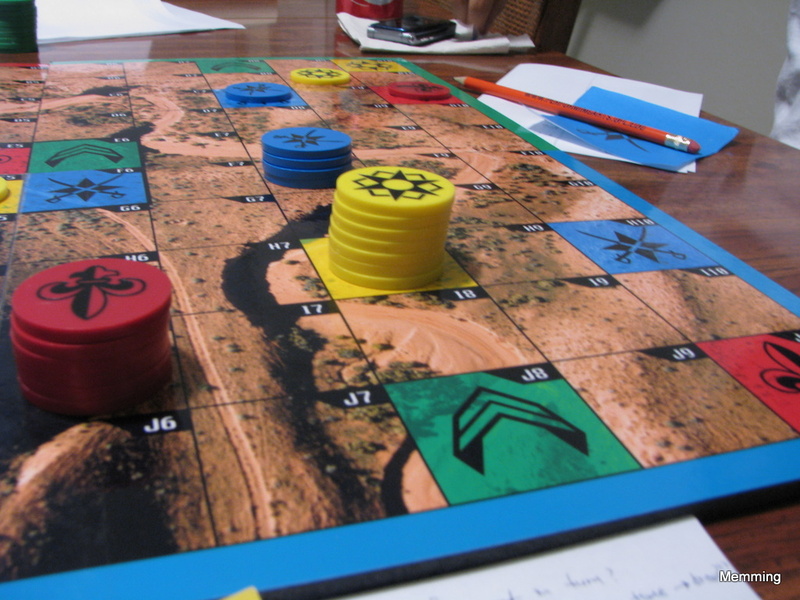 It is a 3-4 player strategy game of no chance. The play time is about 30 mins to 1.5 hours (if you play really slow and cautious). 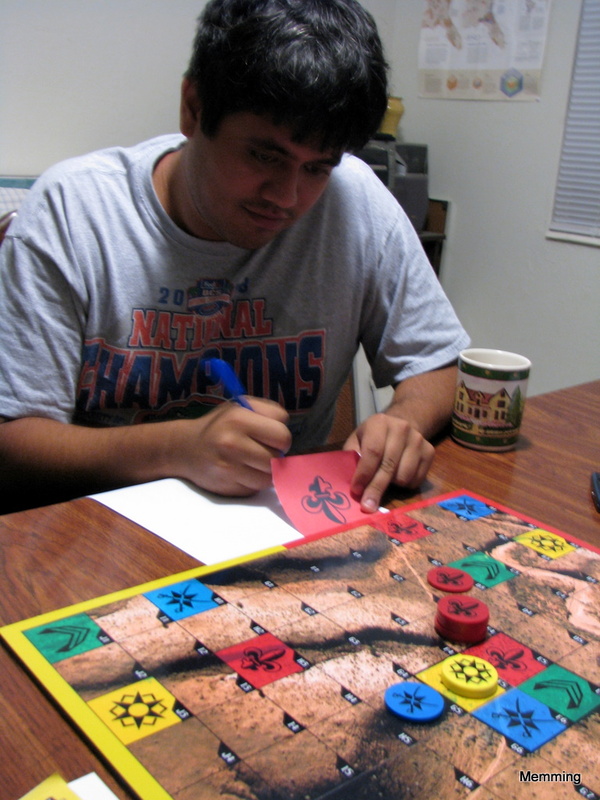 The game is not like the traditional turn-based actions; instead everybody writes down their moves and reveals at the same time (with the exception of reinforcements). This turn-less decision making seems rather fair to all the players, but there’s a catch; when although you write down your moves simultaneously, the moves are made in turns. The first one to move changes every turn, and this can mess you up. Here’s how: if you were to move before your opponent that you were aiming to attack, then you will be able to attack him/her, however, if your opponent moves first, he/she can run away to one of the adjacent squares and if you didn’t predict the move perfectly, you miss. Because of this turn nature, you are strongest when you are the one to move next, and you are the weakest when you are the last one to move. So this gives the game an oscillating power shift during the game. Due to the simplicity of the rule, which only involves moving n number of army from one square to an adjacent square and replenishing at the end of the turn, it is quite enjoyable to analyze and predict the moves. When I have more time, I would like to show you my analysis on the end game situations; tracing back from a winning position to see what board configurations are unbeatable and what not. Maybe I’ll put another blog post on this game. I found that the end is often barely balanced just because other players don’t want to let others win either. This fine line of balance won’t work very well if the players are clumsy at thinking 3-4 moves ahead. It becomes very challenging. I like the game very much. Good job, Hans! Update: One thing I forgot to mention–when writing down the moves, make sure you also write down who’s turn it was to start and where you replenished your army. It’s critical for post game analysis.